Comparing Berkey Water FiltersBy comparison, Berkey water filters outperform commercially available water filters from both the portable and household water filter categories. 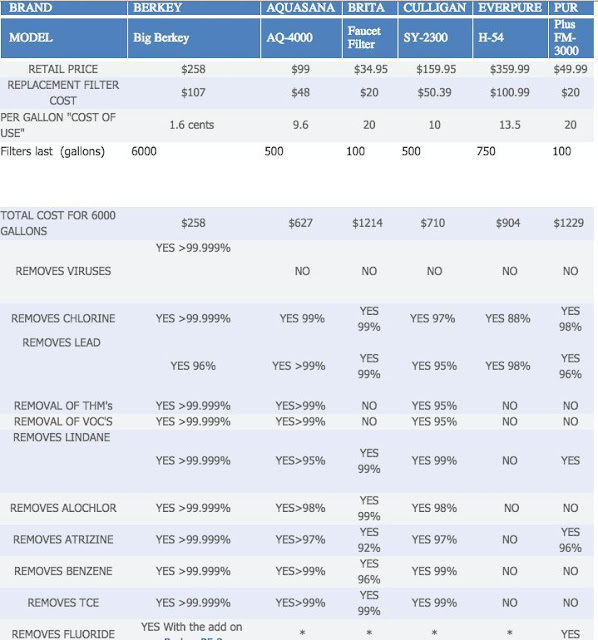 Take a look at these Berkey water filter comparison charts and you can see for yourself that Berkey outperforms the competition in almost every category. Households across America trust water filters manufactured by Berkey. 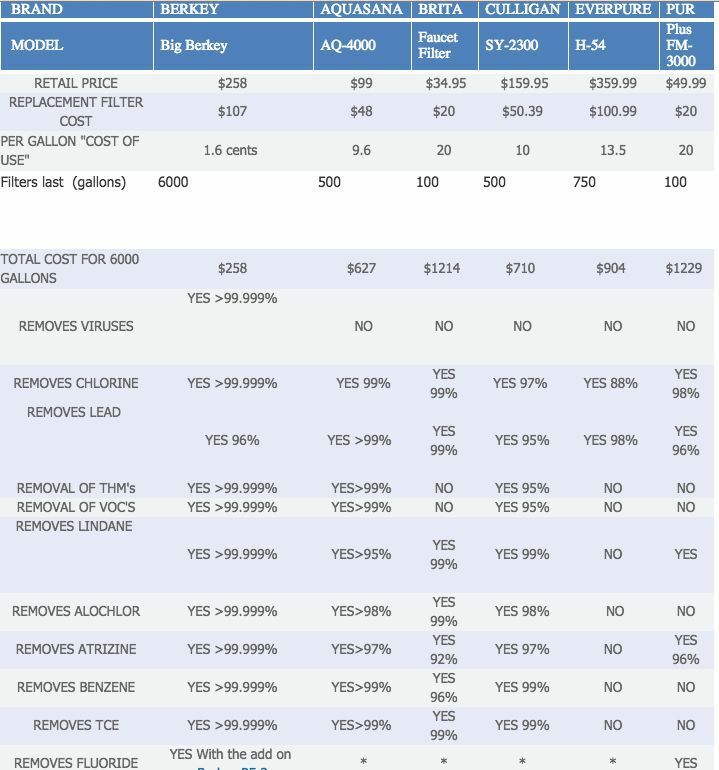 Water filter comparison should encompass more than initial retail cost. When researching water filter systems, you will immediately find that most of them only qualify as filters. Disposable filters that you buy at bargain prices online require frequent changes. Shop around, and before you make a final purchase, ask what the final cost per filtered gallon of water will be. 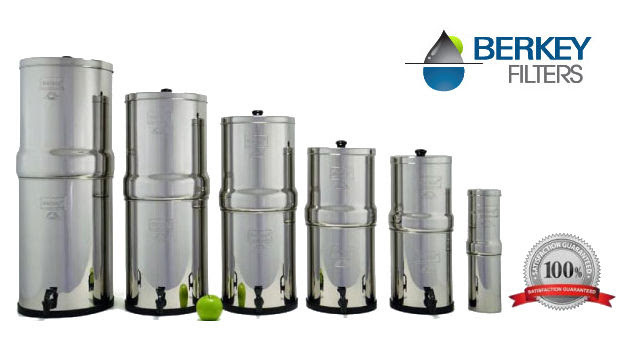 Even though our portable water filter systems are smaller in size, they all contain the same Black Berkey filter element delivering the same clean water you expect with our larger models. Our travel sizes make it convenient to use our dependable filtration systems in small RV campers, summer cabins, or anywhere storage space may be limited. Because our filters are cleanable, it is possible that you won’t need to replace the filter elements for years! 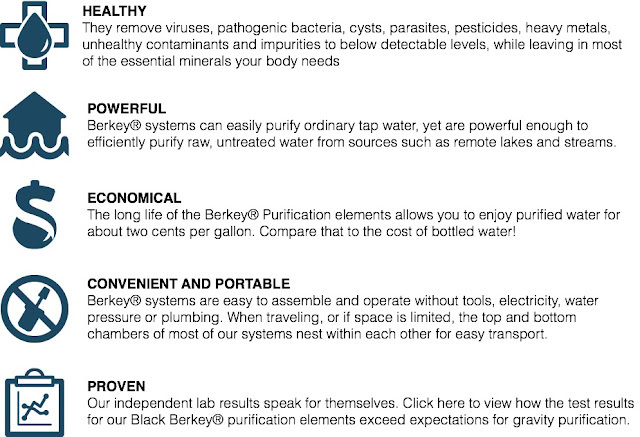 Add the dependability of our filtration systems to the flexibility to use them under a wide range of situations and environments and it is easy to see why so many people already turn to Berkey for their water filtration needs. 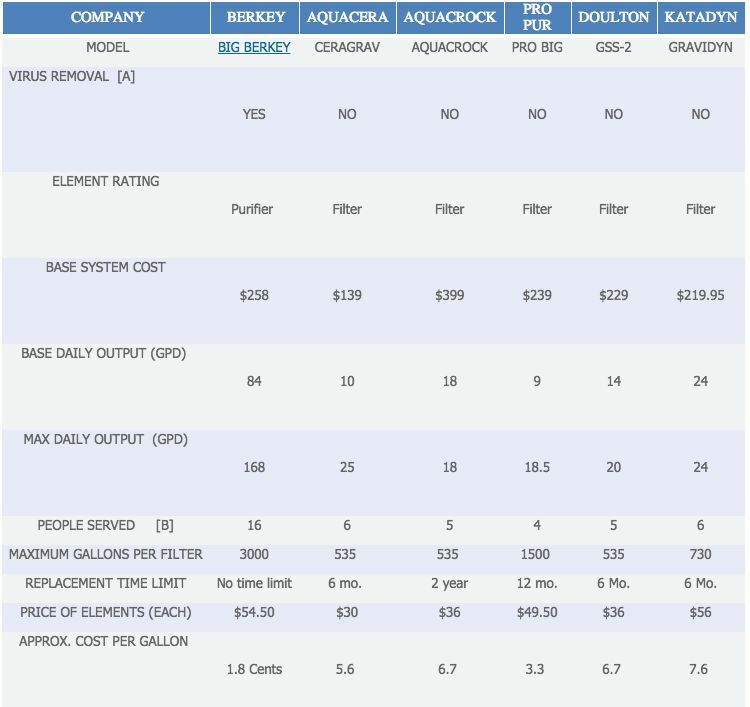 Below is a chart to compare the Berkey Water Filter System to our competition in the portable water filter industry. Below is a chart that compares the Berkey Water Filter to other commercially available household water filters. 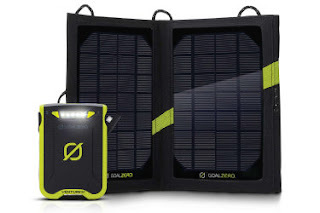 We strive to keep refreshing our shelves for you and in the process, we are having a clearance sale on Goal Zero products. These are the most useful emergency and camping products and what's more - we are offering them at near cost price. Please note that these are in limited quantities. As much as we would like to serve all your orders, we can only do so on first-come-first-serve basis, till the stocks last. Stay prepared for a power outage, wherever you are! 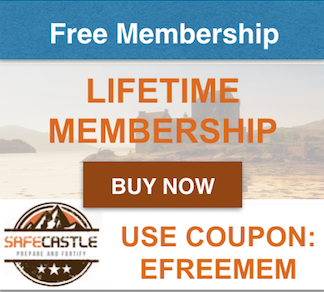 - Members save extra on top of already discounted prices. - Today, that means serious discounts off many of our list prices and even off our sale prices. - It means FREE standard shipping to the lower 48 all the time on everything we sell. - It also gets you first crack at our special limited-quantity product offerings and freebie and rebate deals that come through on a regular basis. Click on image to get the deal..